The military operations undertaken by the Ukrainian and Israeli governments in East Ukraine and Gaza, although frequently being represented as "anti-terror operations", in fact involve the mass killing of civilians on the ground, with US support, under the pretext of the state defending itself. As wars are being waged in both countries, the Ukrainian and Israeli militaries are heavily bombarding civilians as Human Rights Watch has confirmed. The civilian toll in Ukraine has been at least 1,129 so far and 1,650 people were killed in Gaza. The UN condemned the massive shelling of schools and seniors’ homes by the Ukrainian military as it condemned the bombing of a UN school by Israel, saying these violated international law. The similarities between the two conflicts and the ideology that produced them may be worth pointing out, as has been done before in different ways by a critic of these policies and also by the ambassador of Ukraine to Israel, though perhaps not by the way the latter had in mind. The slaughter of civilians, be they ethnic Russian or Palestinian, cannot be divorced from the fact that both the Ukrainian and the Israeli Governments have no intention of granting autonomous rights to these respective populations under their control and may ultimately even see their lives as disposable. The unelected Ukrainian Government did not accept the referendum held in the Donbass in which over 90% of residents voted for self-rule, while in Israel, Netanyahu recently said that he would never support a sovereign Palestinian state. Indeed, both the Ukrainian and Israeli government share highly racist views of these targeted populations. While the circumstances and histories of these two countries are far from being identical, one must take into account the history of the two regions and the prosecution faced by both ethnic Russians and Palestinians when seeking to understand the present crises. For example, the concern with which ethnic Russians regard the formation of a Ukrainian neo-Nazi military unit sent to fight Russian residents of East Ukraine, and the high suspicion with which many view the current unelected Ukrainian government that has significant far-right elements, can only be fully understood when one considers the fierce fighting that took place between Ukrainian Nazis and Russians during World War II in the very same areas where fighting is being waged today. Although not identical in the extend of historical atrocities, one cannot grasp fully the current predicament of Gaza, to which 1.7 million Palestinians are confined, without taking into account the fact that many of Gaza’s residents are originally from Jaffa from which they were expelled from or fled in 1948. Subsequent Israeli governments have indeed viewed Palestinians as a "demographic threat", and Gazans are accustomed to being attacked by Israeli forces since at least 1956. The highly racist manner in which both Ukraine and Israel view residents under their control who do not fit into the image of the nation they claim to represent, cannot but disturb those who pay attention. The former Ukrainian Prime Minister Arseniy Yatsenyuk termed Russians in East Ukraine "subhumans", therefore repeating the phrase "untermenschen" used by the Nazis towards Russians during World War II. 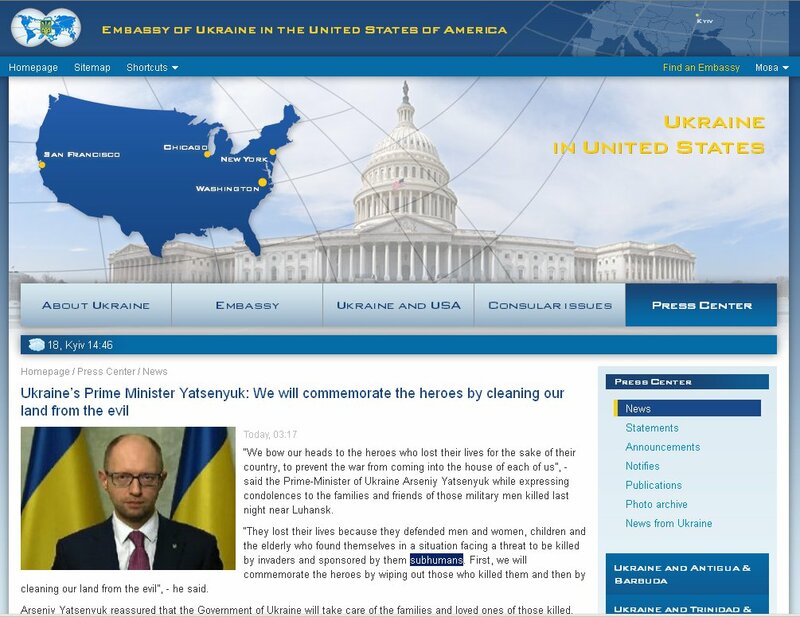 Yatsenyuk made no secret of his intentions towards ethnic Russians in Ukraine by writing that "we will commemorate the heroes by wiping out those who killed them and then by cleaning our land from the evil", therefore suggesting that ethnic Russians citizens of Ukraine are contaminating the ‘pure’ Ukrainian nation. A leading Ukrainian politician, Julia Tymoshenko, expressed her wish to wipe out the 8 million Russians who reside in the Crimea. Leading Israeli politicians also have a highly racist view towards Palestinians. Israeli Minister Naftali Bennet referred to Arabs as those "climbing on trees" in the past. The deputy minister of Religious Affairs, Eli Ben Dahan, said regarding Palestinians that "in my eyes they are human animals, not human". Israeli Member of Parliament Ayelet Shaked, perhaps the Israeli version of Julia Tymoshenko, condoned a mass killing of Palestinian civilians. In both East Ukraine and Gaza, plans or suggestions have been laid out to repopulate the war-torn territories after a victory is achieved. The Ukrainian government openly said that land in Southeast Ukraine, where ethnic Russians and Russian speakers currently reside, will be given to Ukrainian soldiers for free, in return for their participation in the fighting against residents of these areas. In Israel, Member of Parliament Moshe Feiglin of the Likud Party, suggested that "subsequent to the elimination of terror from Gaza, it will become part of sovereign Israel and will be populated by Jews". Needless to say, the Ukrainian and Israeli governments do not seek to represent and guard the rights of the populations over which they rule, a fact that may escape the notice of US State Department Spokesperson Jan Psaki. The first action taken by the Ukrainian parliament after the illegal coup in Kiev, was not to call for a multicultural democracy which would represent all ethnicities, but to revoke the right to use Russian as an official language in areas where a majority of residents were Russian. Although this action was later vetoed, many ethnic Russians who are citizens of Ukraine were quite alarmed by this hostile act taken by the new regime that was never received their vote and where outright neo-Nazi groups share power. In Israel, while a law proposal calling for the removal of the official status given to Arabic did not pass, over 50 laws discriminating against Israeli-Palestinians are in place, ranging from the right to purchase state land to the right to marry freely whom they please. The massive killing of civilians in both Ukraine and Gaza, with full US support, therefore seems to occur not merely as an inevitable and unwanted consequence of war but due to the low regard that the two governments have towards the lives of ethnic Russians and Palestinians respectively. How else can one explain the massive shelling of residential areas in East Ukraine and the targeting of schools in Gaza in which no weapons were found? The Ukrainian ambassador to Israel noted that the two countries are united in "fighting terrorism" but failed to mention that they are also united in the racist view they hold of the civilians they are attacking. Israel does not see Palestinians nor does Ukraine see ethnic Russians as full citizens worthy of rights. The 'first black president' stands firm behind neo-Nazis & fascists. "Yes we can!" Make-pretend liberals watch with thumbs up their posteriors & stand behind President Dead Civilian. Interesting BS. Truth is all of this have been decades in the making from both parties. I, often, wonder what it's like to be so biased and blind to our history. You must be young. Us "old" people have been around long enough to have experienced decades of Republican/Democratic fanaticism and constant war mongering. It's called "broader perspective". You might try it sometime. Sured — curse on both their house, like blame both the Jews and the Nazis for the Holocaust — what a putrid line of bull! That type of "bipartisanship" or "balance" is neutral as between the party who has power and who oppresses the minority, versus the party who lacks power and suffers the bigotry from that majoritarian element. Any "neutrality" like that should get flushed down the toilet along with the rest of the putrefaction that's there. How disgusting such people are! How is that "broader perspective"? Eugene – I'm 43. And I've been registered to vote since 18 & have never been registered with nor voted for either major party. The specific point I'm making is that there's been nary a peep from the people who were against war in 2003 when Bush was president. Most of the people who vote for the Republican Party – save a few pseudo-libertarian hypocrites – are fine with perpetual warfare. Republicans stab in the front. What's disgusting is the back-stabbing of the faux "liberals" who fool(ed) themselves into thinking that voting for the D wing of the War Party was an answer, and now keep their mouths shut as their enthusiastic choice for president slaughters people in a dozen countries. noted that the two countries are united in "fighting terrorism" but failed to mention that they are also united in the racist view they hold of the civilians they are attacking. Actually…I think we can go ahead and equate the two statements. The former label was always about a license to kill (and worse). It means the same thing as witch, and/or works the same way in practice. The standard of proof for both amounts to authority-sez-so. The latter label, I believe, was deliberately cheapened within my lifetime–you'd likely find that someone buying into depictions of Israel/Ukraine as e.g. 'defending iself' are people who'd rarely take a charge of racism seriously, but they do take 'terrorism' seriously. Off-the-radar, in-the-blindspot, etc. : they've seen the racism charge as Crying Wolf for many years now–so the problem of PR cover for racism isn't such a problem. That said, at the level of the ambassador / his receivers in Occupied Palestine, they still need cover such as 'witches' rather than saying goyim outright. So I say: the two statements are the same. Further, they may well know they're the same. Gotta speculate on what word/phrase put my comment in moderation. Coulda been g-yim, or coulda been O-c-upied P-al-stine. Within the last few months, the phrase H-te Cr-me H-ax-s appeared to do it, as well as a link to what was for a couple years the only site to carry certain V-ct-r Ostrovsky videos once they were chased off of Youtube. Definitely appreciated the connection the author made between Palestine and Ukraine. I don't think it's coincidental–what with Nuland installing 'Yatz' and all. Who is Eugene arguing with? Does he have a point? Russia and the East Urainians can defend and fight for themselves. I sympathize with them because they are brave enough to challenge and face down the evil empire of these times. The USA. Israel is killing defenseless people and is nothing more than a settler colony and apartheid state like South Africa was. Israel is a monstrously evil people and should be opposed by any decent human being. There is your “broader” perspective. The Nazis in Ukraine intend to leave the nuclear non-proliferation treaty and acquire nuclear weapons. I wonder which country or countries will help them gain their goal of Nazis with Nukes. US support is NOT going to Israel. US support ALL goes to Hamas. Get your facts straight. You may be onto something, but it's the delivery of that US support that troubles me. When we support Hamas, we have Israel deliver it mainly by artillery or air drops, and somehow the weapons we supply to Hamas in this manner seem to have the fuzes already set when they hit the ground. I have to wonder if we're sending defective weapons to Hamas, or is Israel somehow tampering with our supplies before sending them on to Gaza? An excellent article! The author exposes the rationality of neoliberal state in its current phase. We may add further that the cruel expropriation of Russian territories in Ukraine and Palestinians in Israel are manifestations of barbarism expressly authorized by state power. Are also part of this kind of cruelty and thirst for destruction, the current massacres and land theft of the last remnants of indigenous peoples in Brazil, Colombia, Ecuador, Mexico, Chile, etc . At such times it is good to remember Adorno and his sensible observation that capitalism – at least since World War II – no longer produces cilivilization but barbarism. You may be onto something, but it's the delivery of that US support that troubles me. Lets face it mankind is violent and barbaric speics who are unable to learn or willing to learn from past mistakes and the only way there will be peace anywhere on this planet is if a plague wipes everyone out or astriod hits us.